Midsummer Scream roars to life! Creepy costumes, fog wafting through the air, jack-o-lanterns burning bright, the sounds of screams, orange and black decorations, monsters lurking in shadows...is it Halloween? 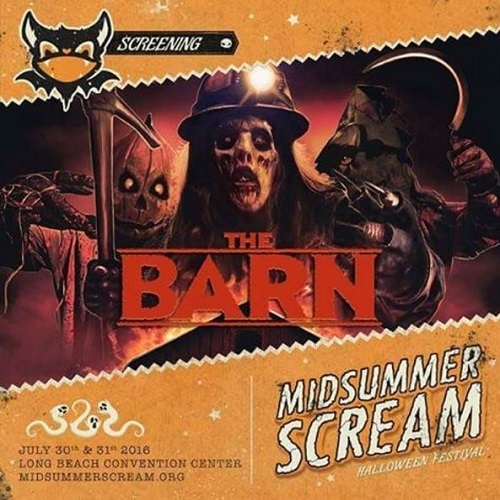 No, it's Midsummer Scream, a new Halloween festival that debuted this past weekend at the Long Beach Convention Center that brings us all things spooky in July! What a treat! Midsummer Scream is a fabulously fun way to celebrate everything Halloween and kick off my favorite season! The event boasted Halloween and horror-related vendors, a huge Hall of Shadows that contained mini mazes and a Toxicity scare zone, panels about your favorite Halloween haunts and attractions, hands-on classes covering a variety of terrifying topics, a "screaming" room that screened horror films, and more! Overall, I was impressed with Midsummer Scream, especially considering that it was the very first year for this event. There is room for a few improvements, but for the most part I really enjoyed myself at the event. I took lots of photos so I could share the experience with you, so below I'll walk you through my day at Midsummer Scream so you can feel some of the Halloween magic, too! The calm before the horror at Long Beach Convention Center! I attended Midsummer Scream on Saturday, July 30th, 2016 and arrived an hour before the fest opened to find parking and check in. Parking was $10 for the day, which was reasonable. Once I got in, the check-in process was well-organized and they had a lot of signage and staff to direct you to the right areas/lines. The Long Beach Convention Center itself was a decent size for the event. It had three levels where all the action took place - the bottom level housed the vendor floor and the Hall of Shadows that had all the mini haunts. It was a great size and it never felt too crowded. The middle floor was where you came in and checked in, plus it had a small cafe, tables and seating, the screening room, classrooms and smaller stages. The top floor had the grand ballroom where the larger panels took place. Some amazing props on the show floor! Knott's Scary Farm cauldron photo op! So cute! stalking the aisles as well. Das Machina - steampunk-inspired machinery and lighting. Krampus LA with costumes on display! Fabulous Frights and their stunning home decor. Abbybelle - loved all the Halloween decorations for Christmas! Six Flags' Fright Fest's creepy clown statue! Monster Maker had so many great items! This Zombie Apocalypse Shooting Gallery was really neat! Boot Hill's booth, a home haunt from Irvine, CA! Hall of Shadows' ominous entrance. Mutant in Toxicity - photo by @misskerry333 (used with permission). Dapper clown in the Hall of Shadows who was great and on stilts! Hall of Shadows ghoul - photo by @misskerry333 (used with permission). Spooky Hollows - my favorite mini maze of the event! Decayed Brigade - photo by Justin Rekt (used with permission). Midsummer Scream boasted a wide variety of panels and classes throughout the day. Besides panels discussing Halloween and its influence specifically, there were panels on ghost towns, this year's new haunts and mazes from Queen Mary, Knott's, Universal Studios, etc., and other spooky subjects. Many of the classes were hands-on where you built your own Halloween prop, other classes were informational, others showed you how to do haunt makeup, others gave tips about building your own home haunts. All of the panels and classes were well-attended, and for the more popular panels people lined up early to get in! Michael T. Kennedy, and Jon Schnepp. I was so busy running around looking at everything that I only went to two panels. The first one I attended was Halloween in Pop Culture, in which a panel including director/producer Axelle Carolyn, Blumhouse's Ryan Turek, director/producer Jon Schnepp, and writer Michael T. Kennedy were led by Collider Nightmare's Clarke Wolfe in discussing their Halloween memories and how Halloween is portrayed in movies. It was neat hearing everyone's early Halloween memories, traditions, and take on the resurgence of Halloween in horror movies. Halloween Horror Nights' panel with John Murdy and Chris Williams. The other panel I attended was Halloween Horror Nights at Universal Studios Hollywood with creative director John Murdy and art director Chris Williams. We got to hear all about their inspiration for their 2016 mazes, which will include brand new mazes from Friday the 13th, Nightmare on Elm Street, Halloween, The Texas Chainsaw Massacre, and The Exorcist. I am most excited for the TCM and Halloween mazes, which sounded pretty awesome in their presentation! TCM will be based on the original film, and will feature facades and interiors of the Sawyer house and gas station. They are also going to take some liberties with the storyline and bridge the stories from the first film to TCM 2. We will get to see Chop Top come home to the Sawyer abode and get to see his psychedelic bedroom. This year we will also get to see Leatherface's bedroom, complete with creepy doll collection. The Halloween maze is going to be focused on the sequel and will pick up where the first Halloween film left off. The hospital interiors should be creepy, can't wait for those! Besides the vendor floor and panels, I really enjoyed walking through Ghoulmaster's Gallery and checking out the amazing collection of artwork in there! Everything in there was gore-geous, including the phenomenal sculpture above (I don't remember the artist - if anyone knows, leave a comment!). There was also a kitten rescue organization there - so many adorable furry friends up for adoption! The Barn - image via Midsummer Scream's Instagram. To close out Saturday, I attended a screening of The Barn, a Halloween-themed horror film I've been dying to see (it was one of my most anticipated horror films of 2016)! It is a retro-throwback set in 1989. "Best friends Sam and Josh are trying to enjoy what's left of their final Devil's Night before graduating high school. But trouble arises when the two pals and a group of friends take a detour on their way to a rock concert, finding an old abandoned barn and awakening the evil inside. Now it's up to Sam and Josh to find a way to protect their friends and defeat the creatures that lurk within." This was probably my most favorite part of the day! The film was perfection - the '80s retro vibe was amazing and completed through music, lingo, clothing, and overall vibe. And the story, wow! It gave us unique villains, it was well-constructed, the characters were all likable, and its Halloween atmosphere was on-point! The Barn is my favorite Halloween-themed movie since Trick 'r Treat! Find out more about this festive film on The Barn's Facebook page! I tried to restrain myself from buying too much (I have no more room for toys and artwork), so I only purchased a few things. I got an official Midsummer Scream tee, gorgeous artwork from Michelle Prebich, the scintillating Jack scent from Black Phoenix Alchemy Lab (plus some samples), and a vintage jack-o-lantern necklace from Frightwares! I spent at least 30 minutes at the BPAL booth sniffing scents! I had a lot of fun at Midsummer Scream, but it wasn't without its problems. However, most of the issues I had weren't with the event, but rather with the venue. The biggest problem was the lack of AC - for an event that boasted it would be a place to beat the heat and that attendees would be basking in AC, it was really disappointing when the bare minimum of air was circulated in the venue. Everyone was sweltering the whole time and I couldn't really enjoy myself while I was sweating through my shirt. At one point in the afternoon it was actually cooler outside than inside. The only cool room in the whole place was the Grand Ballroom, but the whole venue should have been at that temperature. I know there were lots of attendees, but this convention hall had the capability of cooling things down. I think they were just being stingy with the AC, which is unfortunate since it made everyone uncomfortable. I would have enjoyed myself so much more if they had maximized the AC. The venue could have also benefited from more food options. There was a small cafe, which was woefully understaffed and ran out of food early on (not to mention their only vegan items were fruit or chips, their salads weren't even vegan). The food trucks outside were a good idea, but they needed more of them. And the restaurants in the area were nice to have, but their wait times were too long. This stuff is typical of convention centers, but it would have been great if there had been more options, even just vending machines where you could buy cold drinks and more snacks. I wasn't expecting much for vegan options, but all I had was iced coffee, chips, and pineapple to eat (and it still cost me like $20 just for that!). Lovely retro-inspired votive holders and more from this booth. Though the AC and food are venue issues, one thing the event planners could improve on was the program for the even, specifically adding in a map of the entire convention center. Though they had signage, they needed a map of the whole venue in the program to make it easier to find rooms. They had a map of the vendor floor, but they need a map of where all the other rooms were, as well as all the restroom locations, Sometimes it was hard to figure out where to go and where things were happening (I missed a few things I wanted to see because of this). However the upside to this is that the volunteers working the event were very knowledgeable and helpful in directing me to the right rooms, so bravo to them for stepping up! Photo by @misskerry333 (used with permission). Despite the problems mentioned above, I enjoyed myself at Midsummer Scream and think they did a phenomenal job in their first year! The spirit of Halloween was really brought to life at the event, and I had a blast! I'm already looking forward to next year! For more info, check out Midsummer Scream's website!